It is that auspicious day! 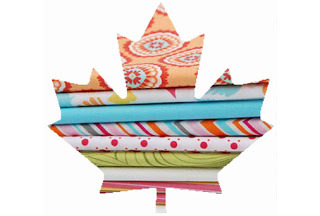 Today I must submit my entry for the all-Canadian Fabric Spot Scrap Challenge to Rachel over at Stitched in Color. And if you were wondering what mysterious thing I was making the other day, wonder no more! 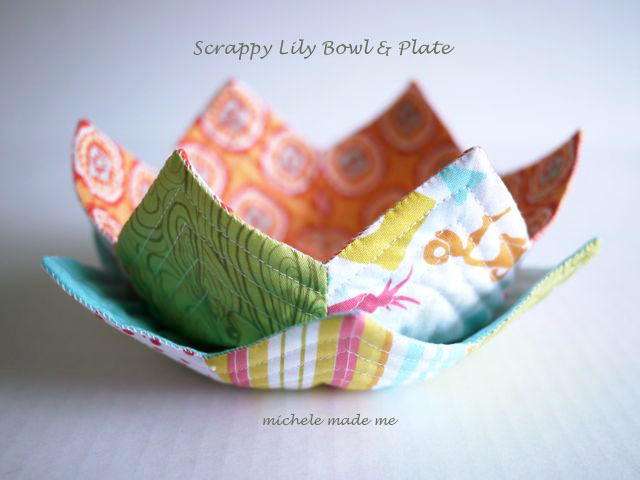 Here it is just under the wire… I’m going to call it “The Scrappy Lily Bowl and Plate”… I think that works as a name, don’t you? Um, so let me think… The rules, if you recall, were: (1) to use some portion of the eight fabric scraps provided in the bundle and one more fabric if we liked, and (2) to have the thing ready by today. So check and check, if you please! Each of them – both the lily bowl and the lily plate – use all eight fabrics. If you’ve ever made a Dresden plate block, you’ll notice that this is a slightly modified, 3-dimensional version of it. Here’s the simple step-by-step just for you! Note: I’m showing you how to make the plate but the bowl is created in exactly the same way. Step 1: Download the templates available HERE. Cut them out. 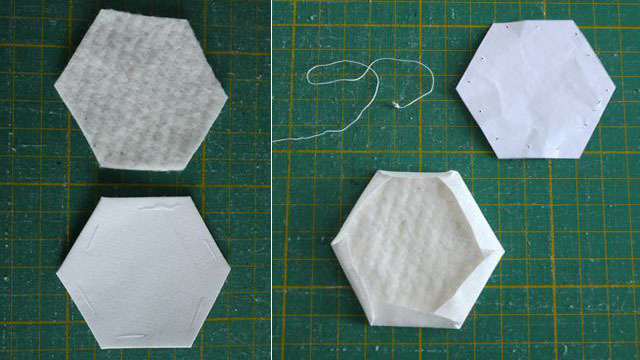 Cut 2 paper versions of Template 3 (hexagons). Note: Don’t mix and match the plate and bowl templates or you’ll wind up with some wonked-out bowls. Step 2: Cut out the fabric and batting/interfacing as shown in the following photo. 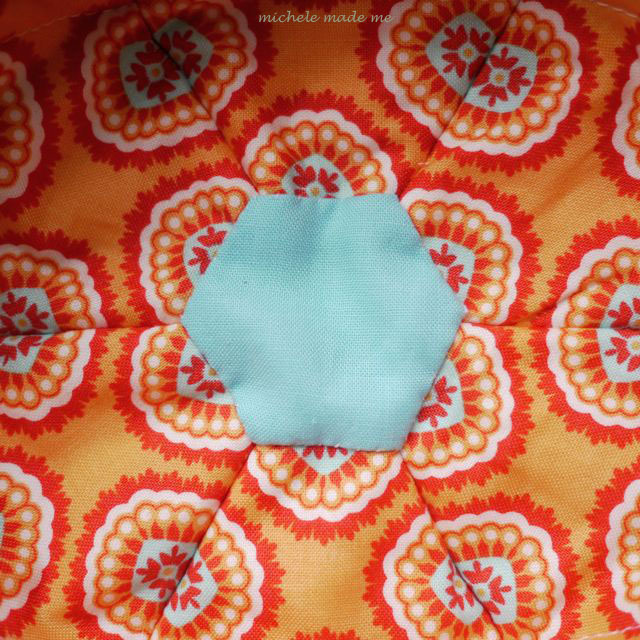 For the two fabric hexagons, add roughly 1/4″ (6mm) of fabric all around the edge of the template before cutting. 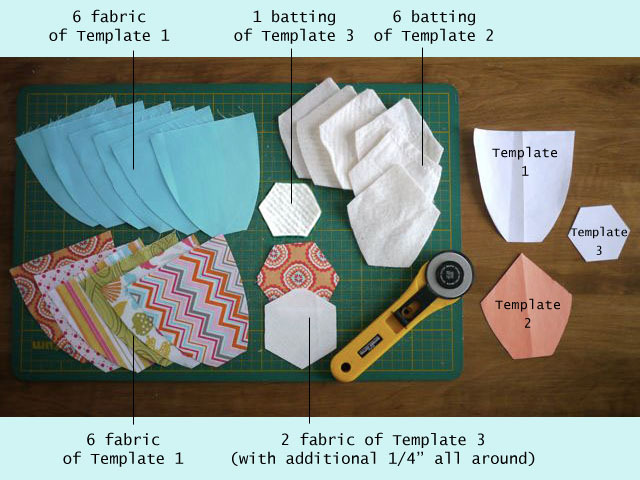 For both sets of six Template 1 fabric pieces, do the following: (1) Take a piece. 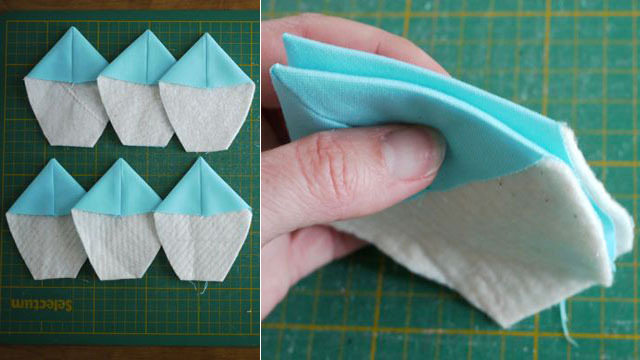 (2) Fold it in half along the length, right sides together. 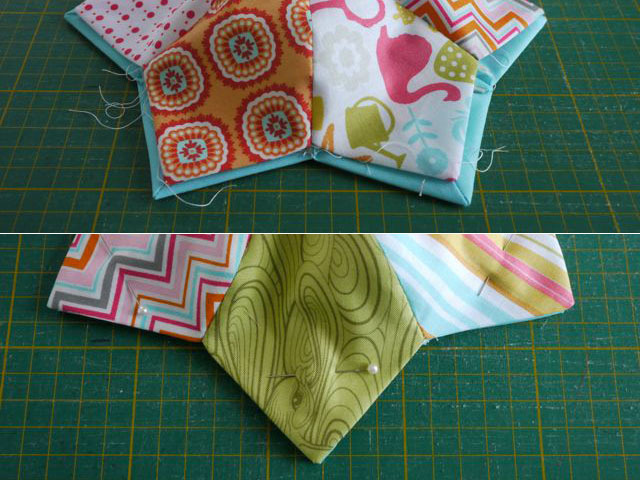 (3) Machine-sew along the top straight edge. (4) Flip the raw edges in. 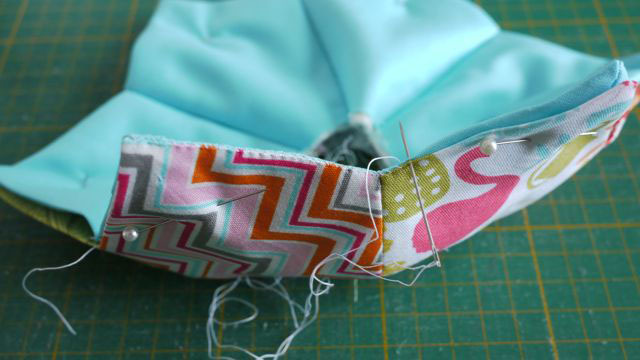 (5) Press the seam down so that it is aligned with the middle of the piece as shown. (6) Now with only six of the Template 1 fabric pieces, place a Template 2 batting or interfacing piece snug inside each. The six batting-filled pieces with make the inside of the plate/bowl, while the other pieces will be the outside. Step 4: Once you’ve prepared all six batting-filled pieces, sew them right-sides together along a raw side edge, two at a time. Step 5: In this project’s case, I have back-tacked at the top edge of my stitching line to reinforce that top joint. Note: Whenever possible, I like to save time and thread by chain-stitching pairs of items together. Step 6: Continue joining all six batting-filled pieces until you’ve got a pretty star. 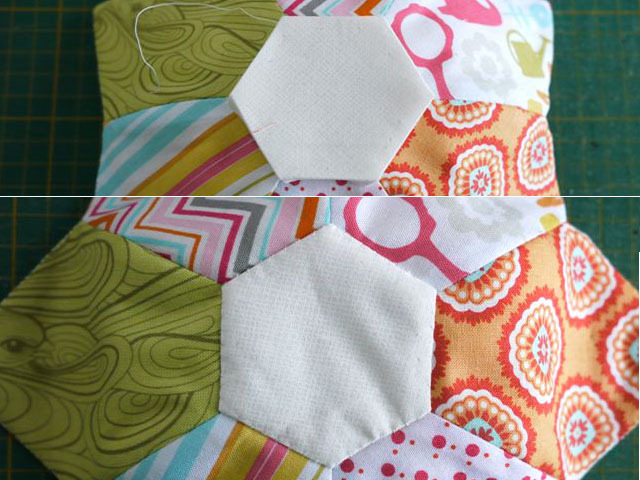 Repeat steps 4 and 5 for the six non-batting-filled pieces to create a second star. Press the seams flat to avoid too much bulk in your bowl or plate. It helps to finger-press the seams open first before running the iron over them. You’ll notice the 3-D-ness of the plate/bowl coming alive now! Step 7: Stack the two stars wrong-sides together. Align their edges and pin. Step 8: Hand stitch around the perimeter with a whipstitch. Step 9: Here I added a few lines of echo-quilting around the perimeter of the plate/bowl. I used my regular presser foot for this. 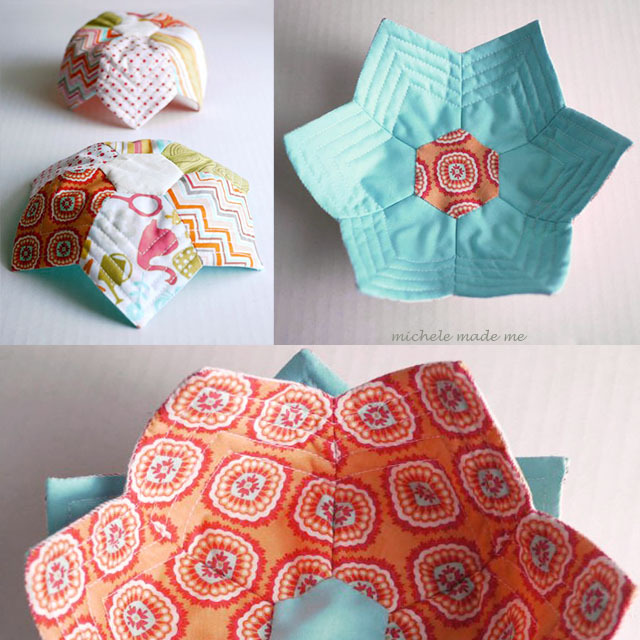 Prepare the two fabric hexagon centers: one for the inside of the bowl/plate and one for the outside. 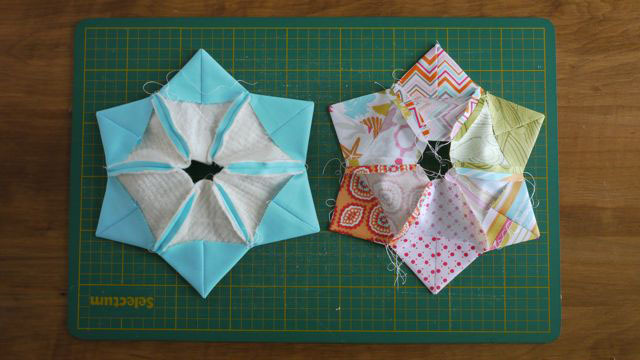 HERE‘s a beautiful demonstration of how-to prepare hexagons by Sunshine’s Creations. Follow the first 10 photos in the matrix only for the two hexagons you’ll need for your plate and bowl. 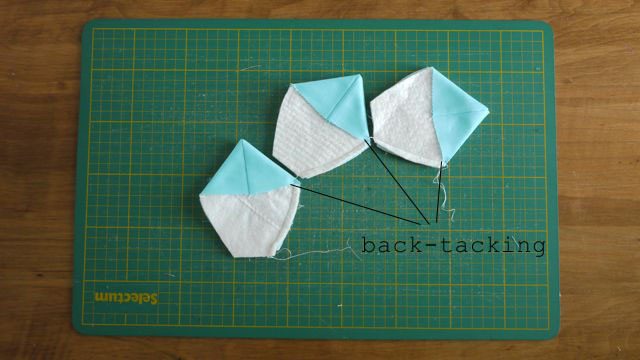 Take one of the two fabric hexagons (the one you’re using for the outside of the plate or bowl) and after pressing it with your iron, remove the thread and paper from the hexagon. Nestle the batting hexagon inside the fabric hexagon and re-fold the fabric edges over the batting. Step 11: Place the batting-filled hexagon on the bottom of the plate/bowl and hand-stitch it in place. Repeat Step 11 for the second hexagon, stitching it to the inside bottom of the plate/bowl. I tried my very best to align the points of the hexagon with the seams in the plate/bowl. Are we done yet? YES. Yes, indeed we are, we are! We have plate-age and/or bowl-age! Wahoot, baby! And how pretty and scrappy they are. Perfect for storing some of those slippery craft supplies or – in my husband’s case – the contents of the bottomless pits known as his pockets. Thank you so much to Karen from Fabric Spot for sponsoring this all-Canadian crafty scrappy challenge, and to Rachel from Stitched in Color for hosting it! I had some good times over the last week creating my little entry and I just just cannot wait to see what my comrades, Laura from Waffle Kisses, Carla from My 1/2 Dozen Daily, and Patti from Retired to Quilt have made! Eep, so excited! Happy happy Canada Day to you! Wow! How talented are you!! I love your bowl and plate with the added bonus of a tutorial! Fantastic! Maravilloso!!!! me gusta la idea, espero ponerla en práctica pronto. Oh! So pretty! I'm glad it wasn't a beanie. This is such a cool project. I could imagine having a whole host of these around. Ha! Mystery solved! I never would've guessed a flower bowl. It is simply gorgeous – I'm pinning it to try myself sometime! Hello!my name is Maria I was born in Canada 40 years ago.Today 33 years later i live with my family in Athens of Greece. I stopped by to say to you that i loved your sewing project but i ihink it is not the first time you have heard this! 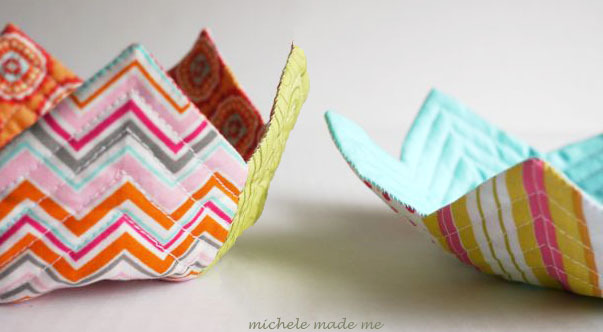 Wonderful,pretty idea,I,ll try to make some bowls with scraps,Thank you for sharing this master class!!! So pretty and so well explained!! Congratulations! Great job!! !I like your bows so much!!!! Super fun scrap project Michelle!! You have such a great knack for envisioning 3D things. Thanks for the templates and great tutorial! Definitely a must make! Thank you! Just fantastic. I love the way that they look when they are stacked as they are in that first picture! Beautiful! 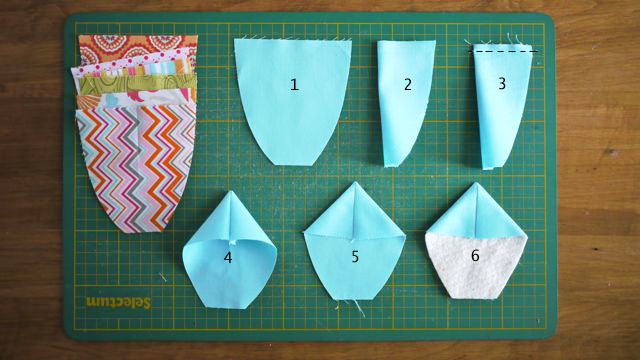 Thank you very much for sharing this very cute proyect and great tutorial with us! Have a nice day! LOVELY. really amazing. wat a lovely scrap use. These are totally precious. I'm always looking for ways to use up my scraps. This is definitely a project I'm going to try. Thanks for sharing. Oooo that is just so very pretty!!! Gorgeous! They are so LOVELY! I have to think you will wow the world with your tiny scrappy creation. Love the two versions as they nest. As always, a gorgeous tutorial, too. Absolutely gorgeous and so very clever! Winter school holidays here in Melbourne, Australia and this is the perfect little project for it – my daughter and I have already cut out the pieces! Yay Fiona! I hope all goes well! Let me know if you have any questions, okay? Do you have a you tube on this ? I do not Frankie, sorry. 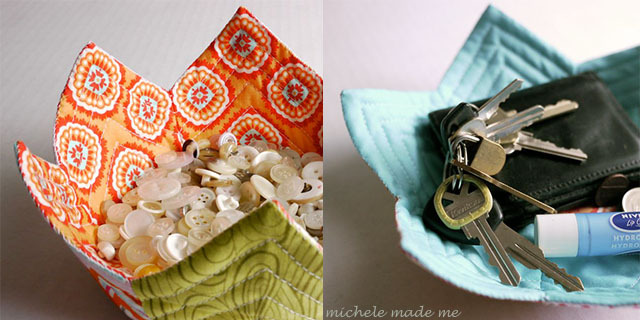 A real fun and clever project Michele! I found this on Pinterest and have downloaded it and hopefully make it today. Its so pretty, thanks so much for doing the tutorial. I'm your newest follower. I've been looking around your blog and you have inspired me tremendously. So pretty, and I just love your construction method! I've just finished making the Lily Bowl & Plate from your tutorial and have posted it to my blog if you'd like to take a look. So very cute! Congratulations on your Scrap Challenger feature. I've never seen anything quite like your little bowl and plate. I am pinning this for future (holiday gift making) reference. I just love the bowls. When I click on the link to the templates I come up with a blank page. Has anyone else had the same problem? How can I get the templates? I really want to give this a try. I'm so excited to try this! I'm going to start on mine today! Can't wait! Love, love, love! Good luck! I love those bowls and can't wait to make one! I have 1 question, I downloaded the templates, but they look quite small. Do I have to enlarge them when I print them out? Maybe you could give the dimensions of one of the templates so I can figure out how much to enlarge them. Sorry it's taken me so long to reply. I'm away from the computer for the month of August. Thought I'd respond to your question though. Um, the pattern is quite small but all pieces fit on one regular A4 or 8.5×11 inch piece of printer paper. Hope that helps! Brilliant project and beautifully made. If you don't mind, I'm going to see if I can make a couple for my kitchen in matching prints for my curtains and favorite aprons. Thank you so much for the lovely tutorial. P.S. Lovely blog! I'm a new follower and look forward to visiting your site often. beautiful project and well presented too! I, too, am unable to print the template. Could be an iPad thing? Could you please email it to me at juliewitt at shaw dot ca? Thanks! It is such a pretty project. Michelle, I tried to print out the tutorial, but have your advertising imprinted into the tutorial. It makes it difficult to see the instructions. I was able to download the template page, but the pictures and directions are not coming out right. If you could email this to me at nleitner@hotmail.com, I would appreciate it. Thank you Nancy Leitner. Also if you can please tell me how to send you a picture of my finished project, I would appreciate it. At what point does the bowl realize its semi-rigid sides and achieve the recognizable shape of a cupped item? Is it as you're stitching the two different-size sides together, or when you tack down the center shape (as though it trusses the sides together towards a center point)? Hello, great tutorial. Thanks for sharing. We took the liberty of translating your tutorial into French to post it on a French quilters forum. I hope you don't mind. Wow these are gorgeous! I love them both! Thanks for sharing the templates and tutorial. How can I print this off without the posts? You can print the template by clicking on the link in Step 1, but you need a gmail account to do so. Hope that helps Martha!